There are many reasons to chart your menstrual cycle. Probably most obvious is to prevent any surprises and embarrassing incidents that may happen if you prefer to stay blissfully aware. Most importantly though, a menstrual cycle ovulation calendar is used to determine the exact time of, well, ovulation. The very heart of the menstrual cycle, ovulation is the determining factor for when women are to be most fertile, and hence is important to those who are either trying to have a baby or avoiding pregnancy. First and most obvious is to simply do the math. Find out your average cycle length – usually around 28 – and from that determine when the first day of your next period should be. From that date, count fourteen days back, and that’s the day you are most fertile. You are also highly fertile in the last couple of days leading to it, and in the couple of days after. A usually more convenient way to keep track is to keep a menstrual cycle ovulation chart somewhere convenient for you – maybe in your purse, on the bathroom mirror, wherever – and consult it when needed. These charts will still need the number of days in your cycle, and depending on this will show the corresponding day of your cycle you would be ovulating and be most fertile. Kind of like a cheat sheet. 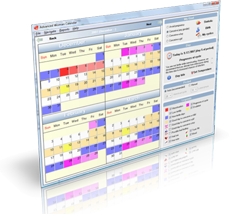 But many will agree that by far the best way to keep track of your cycle in this day and age is to use menstrual cycle ovulation calculator software. 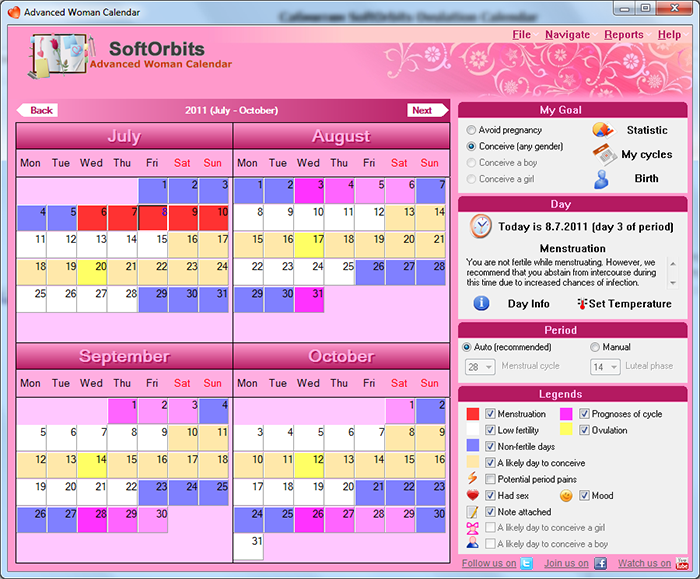 For example Advanced Woman Calendar (http://www.eovulation.com/) uses the dates of your past 3 periods to find your cycle length, accurately determine your ovulation date and most fertile days, and even tells you when to try for a girl or a boy, and, when you do get pregnant, when she or he will be born!